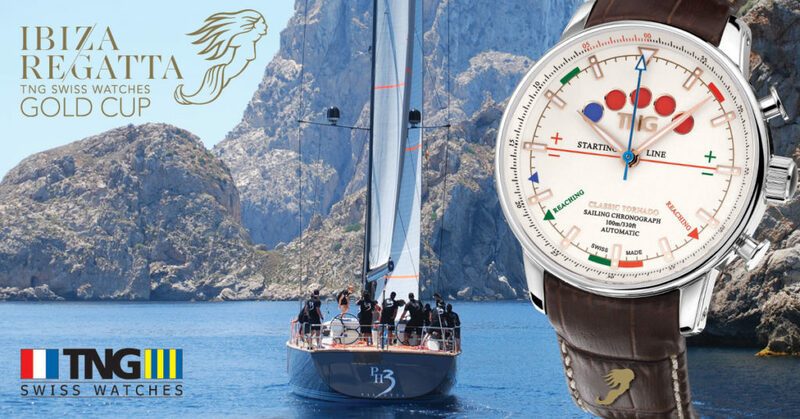 The Mediterranean regatta season starts on May 22 with the TNG Swiss Watches Gold Cup edition of the Ibiza Regatta; the most entertaining and relaxed regatta in the world. This dynamic regatta takes place from May 22nd to 25th 2017 at Ibiza with daily races from bay to bay. Each day there is a different location to moor, offering the most vibrant venues, food and music! Participation is limited to twenty 60 ft+ yachts. Last years winner, the iconic Scorpione dei Mare from Jongerts Yachts, will be defending the title. Also joining is an own yacht from Jongerts Yachts and a few more beautiful Jongerts, as well as the legendary VIXEN II. With the third edition of the Ibiza Regatta Gold Cup, sponsor and official Timekeeper TNG Swiss Watches introduces a special limited edition of the Classic Tornado. This high-quality sailing timer, flagship model of the TNG Classic Collection, contains a Valjoux 7750 timepiece, completed with a TNG-engineered module to drive a disk that shows the five dynamic dots. Each dot represents one minute, therefore this ultimate sailing timer is always ready for a five (or ten) minute countdown. The winner of the TNG Line honours Challenge will be rewarded with this exclusive and much desired watch. To keep up-to-date with the latest news about the Ibiza Regatta TNG Swiss Watches Gold Cup, follow us on Facebook and Instagram.